We often get asked which product is best when upgrading from a single-code mechanical door lock to a more sophisticated electronic version. 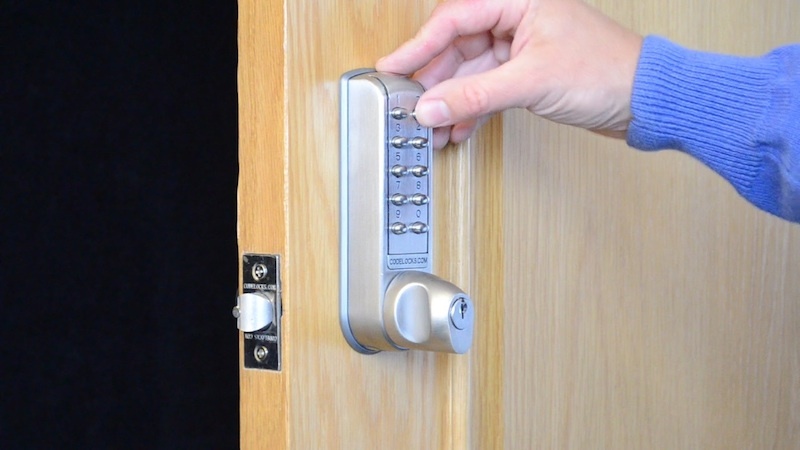 The digital electronic locks in our CL2000 product range have the same fixing holes as the majority of basic mechanical keyless locks, making them ideally suited for this application. 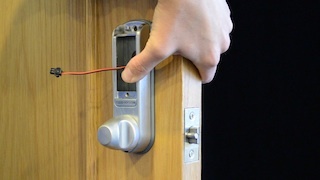 Follow this simple 8-point demonstration and see just how quickly it is to retrofit a keyless electronic door lock. Our fitter completed the task in less than 10 minutes! 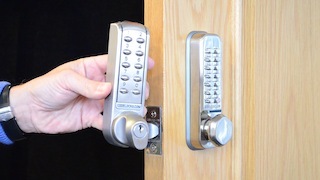 The following steps show you how easy it is to upgrade a mechanical lock (shown on door CL255) to an electronic one (shown in hand CL2255.) You will need a screwdriver and drill, and a 25mm drill bit for wood. 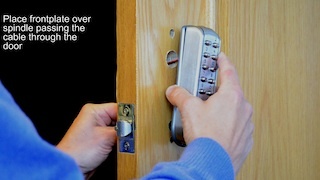 Step one – remove the existing lock from the door, leaving the existing latch in place. Step two – use the gasket from the electronic lock to mark where you will need to drill the extra hole for the battery cable. 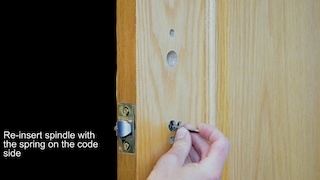 Step three – with a 25mm drill bit (for wood), drill the hole from both sides of the door to avoid splintering. Step four – reinsert the spindle with the spring on the code side of door. Step five – place the front plate over the spindle, passing the cable through the hole. Step six – place the back plate over the spindle passing the cable through the hole in the gasket. 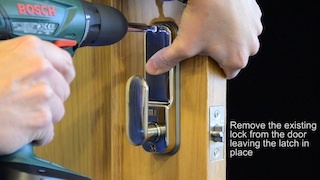 Step seven – use the existing fixing bolts from the old lock to secure the new one. Step eight – install the battery pack and fit the battery cover. Job done! Your new electronic keypad lock is ready to use. If you’d like to see this as a video demonstration, we’ve made a step-by-step guide available on YouTube. If you need any further assistance with your installation our technical support team is available to help you. Please call James, Dominic or Kris on 0800 393405. For more information on our CL2000 range of products, visit our website.